It was a perfect day for Football at Arbroath with the sun beating down on the finely cut grass and it was a game that Annan should have seen out but the Red Lichties salvaged a late point when Ryan McCord cancelled out David McKenna’s opener for Arbroath in the 4th minute of injury time. It was a cruel moment in the match for Annan who had worked their socks off and looked to be heading for a victory in a game of two halves with Arbroath dominating the majority of the first half and Annan looking very much in control in the second half. 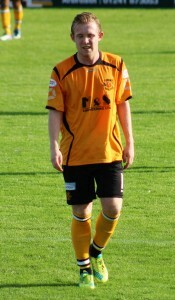 Ramsay was Annan’s star man in the middle of the park. Arbroath started the game very lively. Skelly combined well with Linn down the far side and set him up to cut inside, beat his man and fire a low cross into the box. Arbroath were getting into very good positions but there was no support to finish their moves off. Skelly, a constant threat to the Annan defence in the first half picked up the ball out wide and curled a shot towards goal but it was well saved by Currie. Arbroath were beginning to completely dominate the game and Linn once again managed to cut inside to finish with a shot towards goal which was easily saved by Currie. Arbroath’s best chance of the half came in the 22nd minute. Kader won the ball back in Annan’s half and crossed the ball to Prunty, who was standing near the edge of the area. Prunty managed to turn his man and unleash a shot which was tipped on to the post by keeper Currie. It was a let off for Annan. Annan, who had hardly been in the game at all, then had an attack of their own. Ramsay received the ball 30-yards from Arbroath’s goal, drove forward and fired a shot towards Mutch who made a comfortable save. Just as Annan were beginning to slowly creep back into the match the home side were unlucky again when Linn picked out Kader who’s header crashed against the bar and came back out to Kader again, who fired wide from 6-yards. Annan could consider themselves fortunate to go in level at half time. Annan started the second half with a good chance. Ramsay was played through on goal but Little managed to close him down and force Ramsay into shooting early and subsequently firing his shot over the bar. Linn, who tormented Black throughout the first half, once again cut inside and unleashed a curling effort towards goal, which was well held by Currie. Annan, and particularly Ramsay, were starting to control the game. Ramsay played through McKenna down the right but he fired a cross over the bar. Ramsay then had a shot deflected into the hands of Mutch. Arbroath seemed to be unable to cope with Annan and in the 57th minute Annan broke the deadlock. Rabin Omar picked up the ball on the far side. He cut inside and powered a fierce shot towards Mutch, who could only palm it to the side were McKenna was waiting. McKenna with the goal gaping fired the ball into the back of the net to give Annan a 1-0 lead. Arbroath tried to respond quickly and they almost did when McCord’s cross fell to Linn who saw his shot well-blocked and cleared by Annan’s defence. Smith came on in place of the goalscorer McKenna for Annan. Arbroath had a decent shout for a penalty after good play from Linn, Skelly received the ball in the box and went down but the referee deemed it as a dive and booked Skelly who was incredulous at the referee’s decision. Arbroath made a double substitution with 25 minutes to go as Gold and Doris came on in place of Skelly and Kader. Robertson replaced the injured Krissien for Annan. The impressive Ramsay once again found himself in space down the right. His cross was blocked but the ball fell kindly to him. He beat his man and fired a shot just wide of the post. He was inches away from doubling Annan’s lead. Even though Arbroath were having most of the ball, they struggled to create any real chances. Linn’s in-swinging corner was met by Brown who’s lopping header was cleared off the line by Black. Hester came on for Prunty for Arbroath. Ramsay was replaced by Park for Annan. Gold then won a freekick for Arbroath down the far side. McCord took it but it was easily saved by Currie. It was a very poor decision by McCord who elected to shoot instead of cross the ball. Annan then missed a great chance to finish Arbroath off. They countered quickly through Smith. He played Wright in down the left and with Smith standing unmarked in the box all Wright needed to do was pick him out. However, Wright’s cross was a poor one and it was easily gathered by Mutch. Annan were left to rue their wastefulness. With virtually the last kick of the game, in the 93rd minute Arbroath had a throw in. The ball was launched into the box by Little and it found its way to Linn who was standing unmarked in the middle of the box. Linn clipped the ball back into the 6-yard box. Scott managed to get to it first and knock the ball on towards McCord who bundled the ball into the back of the net to earn an undeserved equaliser for Arbroath. The game though was plagued with controversy at the final whistle. As soon as the whistle was blown, Annan’s Rabin Omar was sent off for aiming abuse at the Referee and Annan boss Jim Chapman was sent off for venturing out of the technical area. ARBROATH :Robbie Mutch, Ricky Little, Gary Phillips, Colin Hamilton, Jason Brown,, Martin Scott, Omar Kader ( Josh Skelly 68 min), Ryan McCord, Bryan Prunty ( Kane Hester 75 min), Josh Skelly ( David Gold 68 min), Bobby Linn. Subs not used Liam Callaghan, Gavin Malin, Michael Dunlop , Ricky Gomes. ANNAN ATHLETIC : Blair Currie, Steven Black, Steven Swinglehurst , Raffi Krissian ( William Robertson 68 min) , Peter Watson, Barry Cuddihy, Rabine Omar, Ryan Finnie ( Willie Robertson 90 min), David McKenna ( Aiden Smith 65 min), Max Wright, Darren Ramsay ( Liam Park 68 min) .Substitute’s not used Alex Mitchell, Adam Ashgar, Tony Ribeiro, Liam Park.